Throughout its deep involvement in Syria's civil war, Hizballah did not neglect its 'second' and primary front – its south Lebanese border with Israel, which today lies quiet, but could ignite into conflict at any time. Hizballah has converted an estimated 200 mostly Shi'ite Lebanese villages and towns into military bases. It has packed residential buildings and underground bunkers with surface-to-surface rockets and missiles, and pointed them directly at Israeli cities. These bases, deliberately embedded in the heart of Lebanese civilian areas, are protected by rings of heavily armed Hizballah cells, trained to engage the Israel Defense Forces (IDF) in ambush-style, urban warfare. Altogether, Hizballah has amassed an arsenal of 120,000 projectiles, representing a level of firepower that is larger than most NATO states. These weapons are produced by Iranian and Syrian regime arms factories, and smuggled into Lebanon via a trafficking network run by Iran's Quds Force. Hizballah's war doctrine is based on the idea of threatening the Israeli home front, and Israel's national strategic targets, while tightly defending its Lebanese bases. Hizballah's presence in neighboring Syria means that it could use that territory too, as a future base of attack. Hizballah's deputy leader, Sheikh Naim Qassam, recently alluded to these preparations when he said, "We are working to fortify our front, and to be ready." These activities all run directly contrary to UN Resolution 1701, which banned Hizballah from moving arms into south Lebanon. Hizballah's bases are also deployed in parts of Beirut, and in Lebanon's eastern Bek'aa Valley. In the face of this threat, IDF ground forces have launched major changes to their training, structure, and doctrine. The goal of these changes is to better prepare them for the possibility of conducting a ground invasion into southern Lebanon (as well as Gaza, the home turf of Hamas), should the need arise. According to senior Israeli military sources, the program aims to redesign IDF units for combat in built-up areas, against the type of hybrid, guerilla-army that Hizballah has become. These plans take into account the fact that Hizballah has amassed a wealth of combat experience from its battles in Syria. It is important to stress that there are no indications that Hizballah is, at this time, keen on initiating a full-scale armed conflict. But the explosiveness of the region, and the ongoing Iranian-Hizballah arms trafficking runs, as well as Iran's activities in Syria, are creating significant tension that could lead to inadvertent conflict. In case of conflict, Israel's objective would be to, as quickly as possible, put an end to Hizballah's terrorizing of the Israeli civilian population through mass rocket attacks. Hizballah could fire hundreds of projectiles per day, and pierce Israel's air defenses, which would, in such a scenario, be stretched beyond full capacity. As they look ahead to this possibility, IDF planners have designed a 360 degree protection shield for maneuvering Israeli forces. The shield would defend IDF units from enemy attacks, which can come from the air, the ground, and underground. In Lebanon, Hizballah has dug a network of tunnels and bunkers, where it stores and moves weapons, fighters, and command and control posts. The 360 degree defense concept is designed to protect advancing IDF forces from all manner of Hizballah firepower, from any direction. It will use things like interceptors, and electronic warfare, to disrupt incoming enemy fire. The IDF's restructuring program also combines infantry and armored corps units, creating new kinds of combat teams which are better prepared to operate in Lebanon. Such combat teams would storm Hizballah positions across Lebanon. 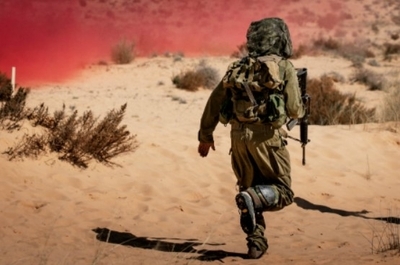 In addition, the IDF has divided up its ground forces into three new categories. The first, dubbed 'Gideon' by military planners, will include the brigades whose job will be to move rapidly into enemy territory. All of these changes will enable "a rapid and lethal ground maneuver against the enemy's centers of gravity," a senior military officer told reporters during a recent briefing. Israel's ground forces are also receiving an array of new capabilities, including their own drones and an ability to precisely strike targets. They will also be able to share data on the location of enemies, in real time. This is vital when facing a foe like Hizballah, which specializes in striking and disappearing quickly. Instead of training in open hilly areas, the IDF is building 13 urban warfare training locations in the next two years, which will replicate the kinds of conditions soldiers can expect to encounter in southern Lebanon, as well as Gaza. These bases will feature mock villages and give the units an indication of what it is like to battle an enemy that has entrenched itself in a civilian, built-up area. A second category of IDF brigades, made up of elite commando units and paratrooper units, would also take part in such a conflict. Together, both kinds of brigades would assault Hizballah targets from multiple directions. They would be backed by air power, which air force planners say would reach a strike rate not yet seen in military history. In addition, the IDF's ground forces are receiving new weapons, designed to quickly detect and strike targets – the kind of targets that appear and disappear quickly in urban settings. The new weapons systems include: A new artillery gun that will fire accurate, guided shells, tanks that can intercept incoming missile fire, and guided surface-to-surface rockets. In addition, a guided, shoulder-fired missile will soon enter service, which can punch holes through walls, giving field units the ability to hit enemies hiding in structures from any angle. Radars, capable of tracking the movement of people, will serve a range of units. New observation systems, that use augmented reality technology (which superimpose information on real images), will give field commanders the ability to instantly identify targets, and order strikes on them. Self-driving autonomous logistics trucks will be able to enter high-risk, enemy territory under fire, delivering essential equipment. And large drones are due to enter service soon, which will be able to deliver supplies, and evacuate wounded soldiers under fire. Although Israel does not seek war, and Hizballah is not likely to deliberately start one any time soon, the growing threat posed by the Iranian-led radical axis is making the Middle East less stable, and more explosive. The IDF's preparations are designed to ensure that if new conflict does break out, Israel will be ready.